Blue Moon Restaurant is a refreshingly, modern Thai restaurant located in Lancaster. We specialise in good quality Thai cuisine and employ professional Thai chefs. Our restaurant is fully licensed and air conditioned. We cater for private functions and booking is advisable. We strive to offer the very best in the quality of our food and service through creative and careful attention to detail. We specialise in good quality Thai cuisine and employ professional Thai chefs. Our restaurant is fully licensed and air conditioned. We cater for private functions and booking is advisable. 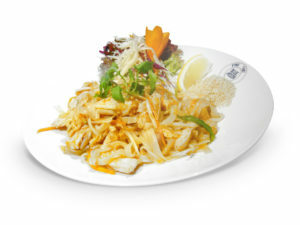 We have an excellent Thai menu with a wide selection of Thai cuisine all prepared using the finest ingredients. You can choose from a selection of vegetarian, seafood and many other popular Thai dishes. Crispy aromatic duck with pancakes, cucumber and spring onions served with hoi sin sauce. Deep-fried soft-shell crab topped with sliced apple, red onion, fresh chilli, coriander, garlic, tomatoes, fish sauce, lime juice and sugar. Marinated chicken with Thai herbs wrapped in pandan leaves served with sweet sesame sauce. Stir-fried scallops with fresh chilli, white onion, Thai herbs and sweet basil leaves. Deep-fried soft-shell crab with Thai chilli paste, white onions, red and green peppers, mushrooms, spring onion and carnation milk. A typical Thai massaman curry with slices of succulent duck breast in a fragrant mild curry sauce with peanuts, white onions and potatoes. AFTER MAKING A RESERVATION PLEASE CHECK YOUR EMAIL FOR CONFIRMATION. DUE TO SECURITY SETTINGS YOU MAY FIND THE CONFIRMATION EMAIL IN YOUR JUNK FOLDER.